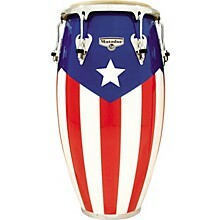 The LP Matador Puerto Rican Flag Conga is a standard 11-3/4" drum with Siam oak shell emblazoned with the Puerto Rican flag. Soft Strike Rims, 5/16" tuning rods, LP ProCare shell protectors, unique side plates, and natural rawhide heads are featured. Proudly fly the multi-banded flag of Puerto Rico, an island that is indisputably the source of much of the world's finest indigenous Latin and Latin jazz music.